Verne Reynolds is famous for his technical proficiency, his many publications (including technically difficult etudes), and his inspiring teaching that has promoted technical development. His students play in orchestras around the world and teach in major universities, and his teaching has influenced professional horn playing as few others have. Reynolds was born in 1926 in Lyons KS and moved when young to Lindsborg, where Bethany College made its faculty available to the townspeople. He began the study of piano at age eight with Arvid Wallin, who Reynolds considers to be his most influential teacher, and also sang in a church choir, directed by Wallin, through college. He started the horn at age 13 when the high school band director handed him an instrument and gave him private lessons. Reynolds went into the Navy after high school, playing piano in a dance band and sometimes horn in a military band. In 1946 he went to the Cincinnati Conservatory, studying horn with Gustav Albrecht, who was in his last year with the Cincinnati Symphony. Albrecht prepared Reynolds for an audition for the symphony, and Reynolds got the job, at age 20. He switched his major from piano to composition. Reynolds completed his degree in composition from the Cincinnati Conservatory in 1950 and a master's at the University of Wisconsin in 1951. He attended the Royal College of Music in London on a Fulbright grant in 1953-54, where he studied with Frank Probyn in a horn class. Dennis Brain occasionally sat in on the class and sometimes made comments and suggestions. "One of my prized possessions is a copy of Mozart's fourth concerto with Dennis Brain's markings on it after he coached me during one of Frank Probyn's classes," says Reynolds. 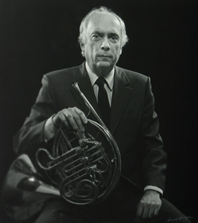 Reynolds performed as a member of the Cincinnati Symphony (1947-50), in the American Woodwind Quintet, and as principal horn of the Rochester Philharmonic (1959-68). Reynolds was horn professor at the Eastman School of Music for 36 years (until 1995) and previously taught at the Cincinnati Conservatory (1949-50), University of Wisconsin (1950-53), and Indiana University (1954-59). A founding member of the Eastman Brass Quintet, he recorded and traveled extensively with that group with a mission to raise the artistic level of the brass quintet. "We try to get an integrity and an artistic level that would come as close as we can to the finest string quartets that you can imagine." Reynolds started composing in college, and his first published work, Theme and Variations for brass choir, won the 1950 Thor Johnson Brass Award. He has published over 60 works (compositions, transcriptions, etudes, methods) and has received many awards and commissions. His compositional style falls into three periods: (1) influenced by Hindemith (50s and early 60s); (2) twelve-tone (late 60s and early 70s); and (3) from the mid-70s, freely using every technique he knows. At the 1994 IHS symposium at Kansas City, former students honored Reynolds by performing a number of his works, with Reynolds providing commentary. In 2005, John Clark oversaw the recording of all 48 Etudes at the Northeast Horn Workshop, also a tribute to his former teacher. Reynolds comments, "I think if you'll take a careful look at the etudes, you'll find that each one has a kind of central purpose. It's been very satisfying to see the attitude about the book change over the years. I think they are beginning to serve their purpose." His book The Horn Handbook, published by Amadeus Press in 1996, stresses many of the themes of his teaching - memorizing, methodical practice to overcome limitations, and thorough preparation, including score study. He was elected an IHS Honorary Member in 1994.